10% of the proceeds from the sale of this work benefits The Arizona Science Center Girls in STEAM. I feel so incredibly lucky to have had the chance to get to learn so much about the Arizona Science Center and to interview Chevy Humphrey. For the last decade, I have lived in the Valley of the Sun, and every time that I have driven by when I am in Phoenix, I say out loud, “I have GOT to go check out the Arizona Science Center!” Thankfully, I was able to get a glimpse of the Arizona Science Center last year when I interviewed my partner on this series Tyler Butler of 11 Eleven Consulting there. After that, I got a deeper look when I toured the Create Makerspace and was invited to use the equipment there to make this piece. I did not get a full picture of just how spectacular the Science Center is until I went and visited on my own. As I walked through the center, I heard children actively engaged in what Chevy calls “serious play.” “Serious play” is when you are playing AND learning/creating/discovering at the same time. There is a special kind of laugher that comes from a child in wonder. I heard it throughout the space, in every room. It was especially boisterous in the “All About Me Room.” It was such heartwarming fun to watch and listen to the kids being “pooped out” of the giant stomach when learning about healthy digestion! As I took my time observing the kids and their parents, I clearly saw why Heidi Jennenga chose the Arizona Science Center to be the partner for her team’s Health & Wellness Value. The “All About Me” area reminded me of my sixth-grade biology teacher at Rutland Town Elementary School in Vermont. I do not recall his name now but, I do recall how he helped to create the person I am today. This smart young teacher realized I had art and a need to be of service inside me. He asked me to make an interactive diagram of electrons that would explain how they worked to my fellow students. In the process of making that model I learned a great deal. I realize that the seed he planted lead in part to how I make art today. All of my art has the intention of teaching others something they did not know about specific to a topic or idea that makes me wonder. WHAT CAN WE LEARN FROM CHEVY ABOUT BEING FEARLESS? Chevy explains that only 26% of STEAM professionals are women. However, women represent 46% of the work force. She believes that we have to “own that gap.” It is our responsibility to get young women excited about STEAM (Science, Technology, Engineering. Art & Math) careers. Not only because our survival as a planet actually depends on these professions but because of the ability to equalize the gender pay gap we see highlighted in the media today. The Science Center believes in lifelong learning because education is power. A commitment to being a lifelong learner helps you to make healthier decisions for your whole life. Let’s face it, life gets boring if we don’t pursue avenues of learning in all stage of our lives. Chevy and I both believe that Art is Science and Science is Art. When you walk through the Arizona Science Center there is art everywhere being used to educate children of all ages about the human body and how to take care of ourselves; our solar system and energy; engineering and building; the art of sound and film; the universe and how we are part of it and history and how it has been effected by science; how money works; and the science of flight and Arizona’s flight history. Exhibits change and improve all the time to keep things fresh and that is an important part of learning. The one thing that is constant is change! One cannot help but notice as you look at each exhibit that there are many companies who are supporting the Science Center. WebPT is in great company. Smart companies know it is important to support the community and to recruit potential employees when they are children. It makes sense that companies like Boeing and Chase Bank, for example, would want to help educate our youth! Chevy drives home that it is “All About Me” when it comes to making better health and wellness decisions and choosing career paths that level the playing field for girls in STEAM. She feels that the “All About Me” exhibit is directly related to WebPT’s Health and Wellness Value and we all agree! The cool factor is definitively established at the Arizona Science Center. Walk through an enormous “working” stomach, complete with the sights, sounds and smells of the digestive process. Watch surgeries being performed, featuring the techniques of Dr. Edward B. Diethrich, in the Heart Surgery Theater. Test your heart muscles in the Wheelchair Racers. Explore the systems of the human body–from defense and immunity to cardio and pulmonary, digestive and skeletal. Hear your actual heartbeat as it is translated into sound on a bass drum. Chevy encourages all employees at the Arizona Science Center to participate in the culture of philanthropy. As a result, there is 100% participation in community volunteer efforts and as a result, happy employees. WebPT and the Science Center both believe in paying it forward and making community better. Standing up for what you believe in is not only good for the community, it is a very smart way for a non-profit organization to operate. Demonstrated reciprocity is a powerful motivator for some donors. There are two kinds of role models in life. Those that teach us who we want to be and those that teach us who we do not want to be. Ironically, Chevy and I both had a very powerful sixth grade teacher experience, although opposite in messaging. Chevy had a teacher tell her she was “lazy and would never amount to anything.” Whereas, I had a teacher who recognized my drive and encouraged me to foster it. I believe it is a powerful thing when a positive role model helps a child to cancel out a negative role model’s potential influence before the negativity frames our thoughts. Negative teachers or society expectations can be canceled out by stronger, positive role models. Teachers, parents, science centers and the like, lift us up in advance to help us survive the people who say we “will never amount to anything.” This is truly what Chevy is saying when she says “paying it forward.” We need to plant the seed of excellence in advance to ensure that the future is much brighter. Chevy believes that we control our destiny by doing what others have not even considered doing. The cognitive discourse that is created by someone telling you it can’t be done when someone you trust and respect has told you that it can is a powerful thing, and it is what creates great leaders. I believe many great innovators in every field became successful just to prove the naysayers that they are wrong. Winning via a positively nursed resentment is a powerful motivator. Going back and claiming victory is very satisfying but also very important to both parties. Thank you so much­­­­­ Chevy for all that you do for our community, for becoming the woman that you are, and for taking time out for this interview! The elements in this piece are the human heart symbolizing both having a the heart for service and healthy heart; the Backbone which is a symbol of what we all need to succeed and live healthfully; the human eye so that people can see success and as a direct reference to Chevy’s words “Watch Me”; and then finally a Child’s Desk to signify the child that Chevy once was and the children that AZSC serves today. These elements were all created using the laser printer in the Create Makerspace. I muted the engraved diagram of the heart and the eye into the background so that you have to really look close to see it. (You most likely cannot see the details from the picture of this piece. You will have to stand in front of it. ) The heart and the backbone were used in the WebPT Health and Wellness piece as well tying these two pieces together. The desk is engraved in plexy glass and you can see through it. We always look through life with the eyes of a child from a school desk. 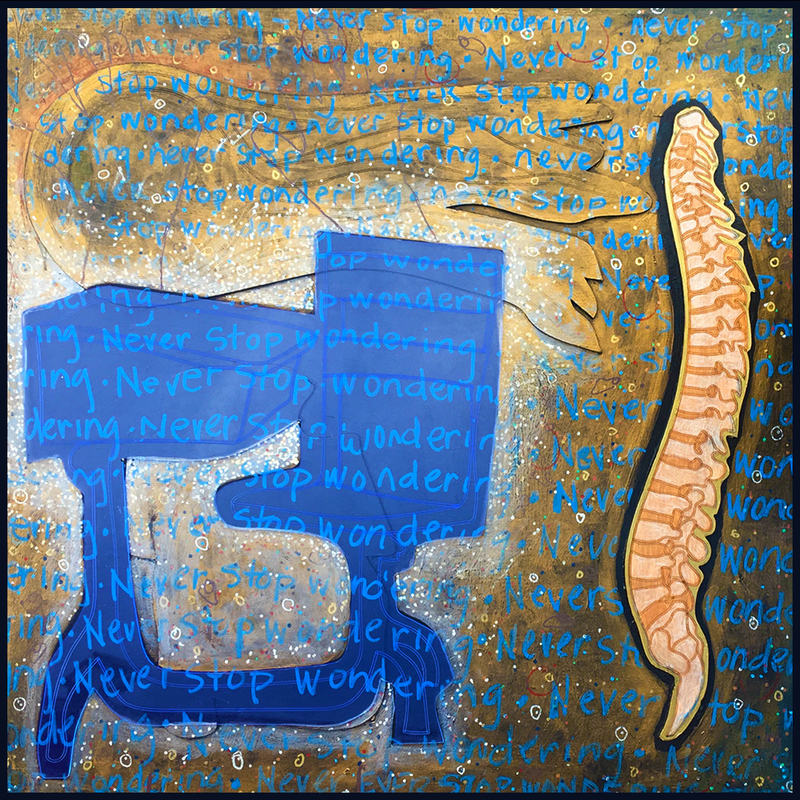 Throughout the piece the words “Never Stop Wondering” are written as if by punishment on a blackboard as a child which is a play on the negative and positive aspect of life’s lessons from positive and negative role models. I always start with a black background because of the memory of the black board and learning as a child so it was appropriate to play a bit more on that theme for this piece. I chose the color gold as a primary color in this piece intentionally because gold is a precious metal and children are our most precious resource. There are a muted set of hands outlined as reminder to symbolize always reaching for excellence. Great Article and fabulous Art….Chevy Humphrey and Michelle Micalizzi, what an inspiring collaboration with one of our favorite nonprofits in the Valley! Thanks again so much Kay!